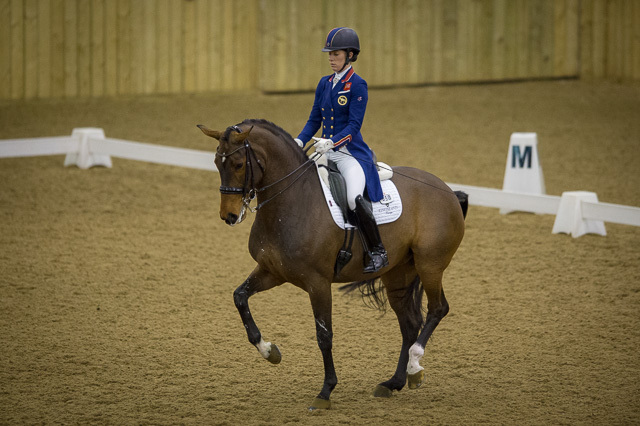 Charlotte Dujardin and Mount St John Freestyle made their international grand prix debut a winning one yesterday (5 April) at the Zeeland CDI in the Netherlands. Charlotte and Emma Blundell’s exciting mare, who already looks to be strong contender for the World Equestrian Games (WEG) team, topped the grand prix line-up with more than 75%. This is only the pair’s second competitive grand prix, having exceeded 80% on their debut at the level last month. “She’s never done anything like this before, but she felt really good and warmed up amazingly,” Charlotte told H&H. “We had some little blips — she started cantering in the extended trot, which was really costly, but she did some really super things. The Fidermark mare, who is still only nine, will compete in her first ever grand prix freestyle — and just her second music test ever — this evening. “I’m keeping it simple as I don’t want to scare her. But in a month or two it’ll be different,” said Charlotte, who plans to compete Freestyle at Windsor, Bolesworth and Rotterdam CDIs this summer. Second to Charlotte was Sweden’s Juliette Ramel with Buriel KH, followed by the Netherlands’ Hans Peter Minderhoud riding Glock’s Dream Boy, a 10-year-old Vivaldi stallion who was also making his international grand prix debut. Best of the chasing Brits was Gareth Hughes and Don Carissimo in 13th, the pair’s second international outing since having to withdraw from the 2017 European Championships. The Olympic champion has made her long-awaited grand prix debut on Mount St John Freestyle. Fiona Bigwood (Kjaerholm’s Abutsiaq), Sarah Millis (Hofjuwel), Steph Croxford (Mr Hyde) and Dan Watson (Amadeus) were also in action for Britain in the grand prix; they filled 18th to 21st places respectively. Charlotte also enjoyed victory with her own mare Florentina, posting plus-77% to win both the prix st georges, and the inter I — the eight-year-old Vivaldi mare’s first test at the level. She will compete in her first ever freestyle test – the inter I music — this afternoon.